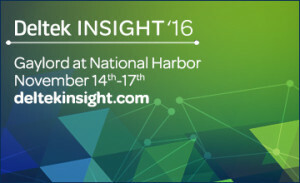 Sand Solutions will be at Insight 2016 as a Platinum sponsor and presenting three timely topics. Attendees are invited to visit our team at Booth #3 or to reach out to us to further explore the latest developments in Hybrid hosting, Costpoint Extensibility, or leveraging and integrating the utilization of their centralized Deltek applications. Recognized as the leader in Hybrid cloud hosting, Sand Solutions will also be rolling out its latest offerings in cyber security coupled with the creation of multiple dashboards securely sent to personal devices. To receive a personalized demonstration of the latest in Sand Solutions security or to review your hosting requirements, please reach out to us to schedule individual appointments while at Insight. Sand Solutions looks forward to reconnecting with many long time friends and the opportunity to meet new ones. Come help us celebrate our 10th anniversary.